Starts with you as President (or Prime-Minister) of a modern country. The country is a run as a simple democracy where you need to get over 50% of the vote each election in order to remain in power. The object of the game is to stay in power as long as possible (there are no limits as to how many terms you may be elected president). 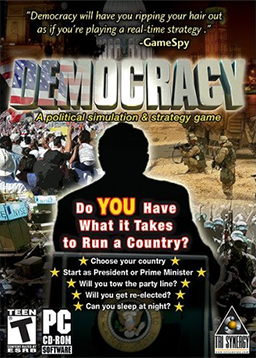 Democracy is a detailed simulation game that is 'turn based' where each turn of the game represents 3 months of time. Elections are held every 4 years. The game has a complex internal model to represent the population of your country. A large number of different 'voter groups' are modeled, such as Motorists, Trade-Unionists, Unemployed people, Wealthy people etc. The simulation allows people to be in several groups at once, so for example, an unemployed poor motorist will be influenced by the opinions of all 3 groups when it comes to election day. To promote Democracy and grow its popularity (top games), use the embed code provided on your homepage, blog, forums and elsewhere you desire. Or try our widget. Mac demo of Democracy, a politics simulation game. Windows demo of Democracy, a politics simulation game.